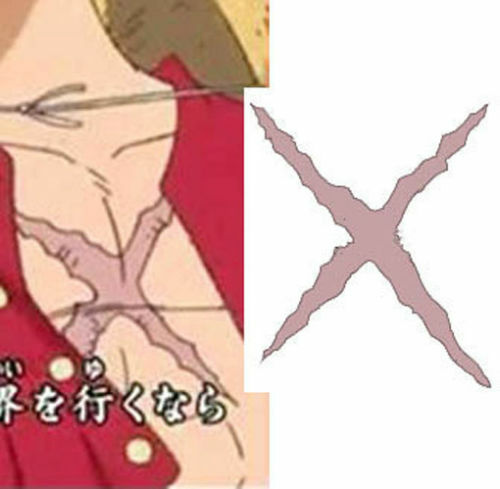 Why is Luffy's scar shaped “X”? I know that Luffy got his scar on his chest from Akainu from How did Luffy get the scar on his chest?. As mentioned on the linked question, Luffy got his scar because his chest got burnt by Akainu's magma fist. In the end, his wound was like a burnt wound, that means his skin was scorched. When his burnt wound healed, why is his scar shaped like "X" like it was a wound of getting sliced by a sword? I thought the skin that was burnt will leave a scar like a "burnt wound's scar", not a "cut off" scar like that. Taking the answer Oda gave in SBS 62, we can safely assume that the scar is indeed from Akainu. If we take a look at some various things, we can come up with a fairly good estimate as to why the scar takes the shape that it does. Firstly, Luffy most likely took less damage due to the attack being blocked by Jinbe. This means there is a chance that there was less burn damage. Luffy is made of Rubber, rubber melts before it burns, and with Jinbe taking the a portion of the attack, there is a chance that rather than burn, his skin would have melted, possibly creating points, rather than a round hole. From here, we know that he received medical treatment fairly quickly. Once the internal damage was rectified, the hole would need to be sewn back together. If we assume that the skin was melted in the way stated above, it's not out of the realm of possibility for Law to have only had the option of stitching it back together in this manner, thus leaving a sort of x shaped scar. This is the best I can figure, based on speculation. Yes, I know that this is a forum but this is the closest to an answer that we currently have. How did Luffy get the scar on his chest? Who is Monkey D Dragon's wife / Luffy's mother? Why does Shanks already have his scar at the beginning of One Piece? Why was Bartholomew Kuma after Luffy's head at the conclusion of the Thriller Bark arc? How do Luffy's Gear attacks work? Is there any explanation for Whitebeard's Crescent-shaped mustache? 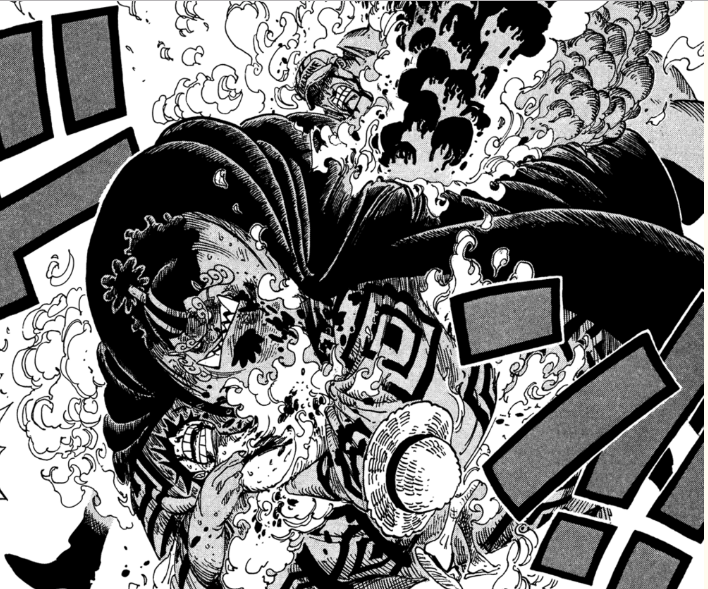 Was Luffy able to activate/experience Kenbunshoku Haki in the War of the Best? Difference in strength of luffy's gear forms?